Love your website! Today I ran 5 km's in the Algernon race in Marseille France. My time was 25 minutes, 38 seconds. I am a 44 year old woman, average height and build (5'5" and 9 stone 2 lbs) and I have been running regularly since March this year. This 5km was a mixed race and up one of the hills I pushed a wheelchair and also along the gravelly final stretch. Maybe that added a couple of minutes to my time, hard to say but so worth it to be able to help someone. I did my first half marathon in May which was tough, the Aix en Provence one (I had a displaced kneecap by the end which I have now fixed with made to measure orthopaedic insoles), I finished in 2 hours 24 minutes which I was very disappointed with. It's a hard half, very hilly, very hot, but I was gutted to be so slow. Goal 1. On 12 November there is a 12 km fundraiser I'd like to participate in, would be nice to finish in 1 hour. 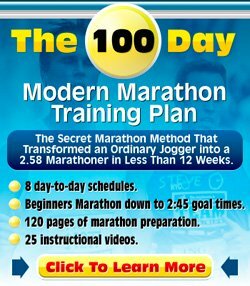 How far should I run while training for that and how many times a week? Bearing in mind I have 6 weeks to train. Goal 2. I'm aiming to do another half next March and want to finish in under 2 hours. Basically I want to nail it. Meanwhile I will put in the hours each week, running three to four times a week and will do some 10 km races to keep me revved up. What is the optimal distance that I should be doing in training please? I eat healthy, am a non-smoker, drink very little and my other hobby is classical ballet, I take a class once a week. Sorry for such a long question. You have provided a lot of information. The only element that is a bit unclear is how many kilometers you run per week and what your typical long run is at the moment. This makes it a bit hard to get very specific. Starting with goal 1, your 12k run not too far away. In order to run a good 12k you need to have a good base of easy and long running, combined with some good tempo running. Tempo pace is often described as the pace you can sustain for an hour, which exactly coincides with your goal of running your 12k within the hour. You will want to do one tempo run per week accompanied by some easy and longer runs. You really want to get used to covering that distance. For your second goal, running a half marathon in two hours, you have a bit more time. I would start off with a base building period. Mileage is the most important component. I usually do one tempo run per week, even in the base building period. It would be great if in your training you'd be able to build up to regularly doing 18k - 24k runs. You really want to get used to running that far on a weekly basis if you want to get faster. Closer to the run (about 2-3 months out), I would start doing some intervals as well. Interval running can help give some speed and strength to your legs. Interval sessions aren't the most enjoyable, but very useful for a fast race. Best of luck with your upcoming races.